The weather is turning nicer, spring flowers are soon to bloom and Mother’s Day sits amidst the beauty of it all. Burnbrae Farms knows how special Mother’s are and to celebrate all of those special people in our lives who have inspired us over the years, just like our moms have, they are giving away a prize pack valued at over $540 to one lucky winner! Tweet to enter! 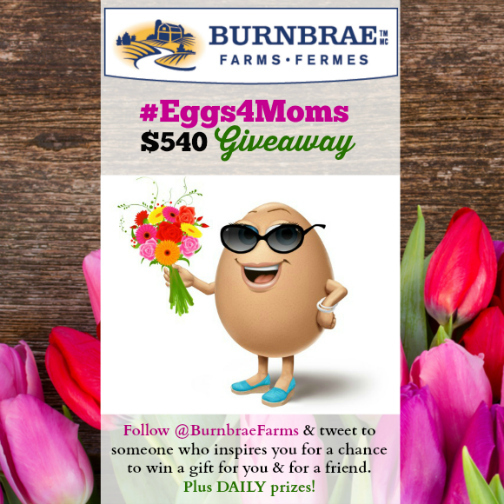 Each person on twitter will follow @BurnbraeFarms and tweet the following, tagging a Twitter friend in the tweet using #Eggs4Moms between now and May 1st 11:59 pm EST. You can tag as many friends as you like, male and/or female, as often as you like using the entry tweet and hashtag. Grand Prize Winner: iPad Mini, $60 iTunes gift card, $100 Visa Gift Card plus Burnbrae Farms & Naturegg free product coupons. Daily Prizes: Through the life of the #Eggs4Moms contest, we will award daily coupon prizes to participants Monday – Friday! Eligibility: Open to Canadian residents 18+, excluding Quebec. Read the official rules and regulations HERE.